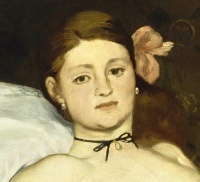 Olympia (detail) by Édouard Manet was a succès de scandale when it was first exhibited at the Paris Salon of 1865. Today, it is considered as the start of modern art. The Paris Salon of 1865 was opened late April or early May. Its most important painting was Olympia by Édouard Manet, painted in 1863. Unless indicated otherwise, the text in this article is either based on Wikipedia article "Paris Salon of 1865" or another language Wikipedia page thereof used under the terms of the GNU Free Documentation License; or on original research by Jahsonic and friends. See Art and Popular Culture's copyright notice. This page was last modified 15:14, 29 March 2013.